Tickets are in hand, and the bags are packed. I’m off with my girl friend and parents to spend Christmas and New Years in Puerto Rico. With this trip in mind naturally my ears have been tuning to the sounds of musica puertorriquena more and more, specifically christmas music from the pearl island. For most of my life I’ve hated Christmas music. But that was when I thought all Christmas music was either Christmas carols or sappy nostalgia records. I was overjoyed when I finally found Christmas music that was rich with all the ingredients for the pelanga we love to cook up. There is a wealth of Christmas cumbia, merengue and guaracha that goes perfectly with dancing, drinking and lechon. 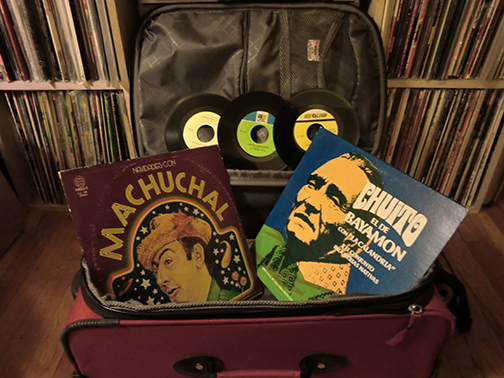 Here are some of my favorite jíbara records that I’ve I packed for the trip. Cadenas Navideñas—El Chuito de Bayamon, an absolute legend of the jíbaro tradition and someone who we’ll feature more of soon. As a little present you can download all these songs plus few more here. ¡Feliz Navidad! This entry was posted in PELANGA RECORDS! and tagged Christmas, Chuito del Bayamon, Conjunto Los Sureños, Davilita, El Gran Trio, Guaracha, Jíbara, Jose Santiago Vega, Machuchal, Navidad, Puerto Rico by Jacobo (DJ Pozole). Bookmark the permalink.